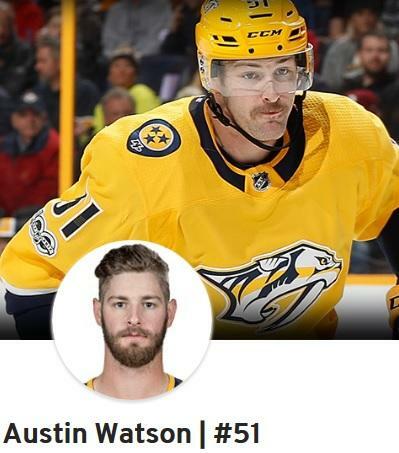 NASHVILLE, Tenn. (AP) — Forward Austin Watson has been reinstated to the Predators' roster after serving an 18-game suspension for domestic abuse, and he issued a statement apologizing to everyone for the June incident that cost him the start of the season. Watson issued the statement Wednesday through the NHL Players' Association thanking his family, friends and the Nashville Predators for their continued support. "It is a privilege to play in the National Hockey League, and I am grateful to be able to once again compete with my teammates," Watson said. "I apologize to Jennifer, my family, Jennifer's family, my teammates, the Nashville community, and the Nashville Predators for the negative attention that has come from the events on June 16th." Commissioner Gary Bettman suspended Watson for 27 games on Sept. 12 for unacceptable off-ice conduct after an investigation and a hearing with Watson after he pleaded no contest in July to a charge of domestic assault stemming from an incident in June. Arbitrator Shyam Das reduced the suspension to 18 games , allowing Watson to return to the ice Thursday night in Arizona. The NHL does not have a written domestic abuse policy and has chosen to judge each incident separately. Slava Voynov is currently still suspended indefinitely for a 2014 incident. Watson concluded his statement asking for privacy on this issue. "Out of respect for my family's health, well-being, and privacy, I will have no further comment on this matter moving forward," Watson said. The Predators, who are wrapping up a five-game road trip in Arizona, also issued a statement saying Watson has served his suspension and the organization continues to support Watson, his girlfriend and their baby as they work together as a family. The team statement also noted that the Predators also will have no further comment "on this matter."